The world's most famous hobbit joins Jack Black on the cast of Tim Schafer's Kickstarted adventure game. Double Fine head honcho and adventure game legend Tim Schafer stopped by Spike TV's VGX to show off some gameplay for Broken Age, the developer's Kickstarter-funded adventure game. Along with game footage, Schafer revealed the latest voice actor to join the cast: former Hobbit Elijah Wood, who will take the role of Shay. Wood joins Jack Black and a slew of experienced game voice actors, including some from previous Schafer projects. Broken Age is Tim Schafer's first adventure game since Grim Fandango; Schafer told VGX hosts Geoff Keighley and Joel McHale that publishers told him to make other kinds of games, but fans never stopped asking for another classic adventure title. 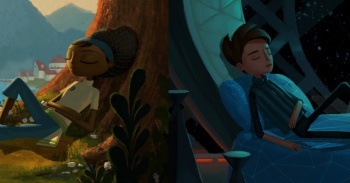 Despite the adventure game's crazy Kickstarter success, Broken Age hit some financial snags along the way, which resulted in it being broken up into two parts. The first half of Broken Age is due out next month, which will be almost two years after the Kickstarter initially launched; hopefully backers will feel that it was worth the wait.